currently under construction at Welland Avenue, Saint Catharines. The development is scheduled for completion in 2019. Sales for available units range in price from $439,900 to over $459,900. The Enclave Phase 2 has a total of 24 units. Sizes range from 1651 to 1884 square feet. Cosmopolitan Homes invites you to discover townhome living at its very best in their newest residential community — The Enclave. 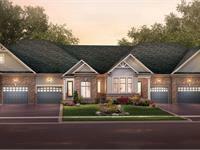 Located in St. Catharines’ desirable “North End” this intimate enclave neighbourhood, featuring a limited number of freehold bungalow townhomes, takes full advantage of an unbeatable location that’s in the centre of it all. Whether you’re settling down or just starting out, St. Catharines itself has a comfortable “small town” feel, yet it also boasts an eclectic mix of restaurants, galleries, boutique shoppes and historic landmarks — all just minutes away from your home at The Enclave. Nestled below the Niagara Escarpment, the surrounding countryside provides a rich palette of natural beauty — Lake Ontario with its numerous beaches and marinas, rolling fields and meadows with an abundance of cherry, peach and apple orchards, rambling vineyards and wineries — it’s all in your own backyard as part of the “gateway” to Canada’s wine region. - Self-sealing lifetime asphalt roof shingles with metal valley flashing. - Luxury exterior low E Argon vinyl casement or hung windows on front elevation. Low E vinyl casements on sides and rear. - 1.5 car garages with optional direct house access. - Imported ceramic tile flooring up to 13?x13? in front foyer, kitchen, powder room, bathrooms and main floor laundry, as per plan. - Quality 40oz broadloom throughout including main stairs, except for designated ceramic tile areas (one colour throughout). - Trim: door casing to be 2 3/4? with 3 1/4? baseboards. - 9 ft. ceiling height on main floor with optional cathedral ceiling in Great Room. - Open concept 1 and 2 bedroom floorplans. - Quality kitchen cabinets and vanities with selection from Builder’s standard samples with available taller upper cabinets. - Islands and breakfast bars as per plan. - Double stainless steel sink with washerless single lever pull-out faucet. - HRV (Heat Recovery Ventilation) unit installed as per OBC Compliance Package J. 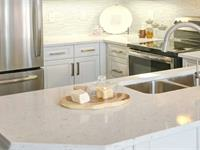 - White Decora switches and receptacles in finished areas. - Great Rooms with available gas fireplaces. Your inquiry will be delivered to the The Enclave Phase 2 sales team, who will send you more information about this development.